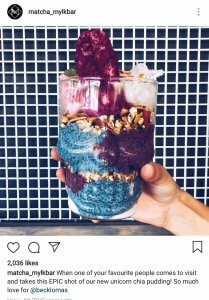 ‘Tis the season for some Instagrammable Halloween treats! Whether you’re planning a party at your house, want to wow your trick-or-treaters, or you need to bring a plate of goodies to a friend’s place… you’ll be sorted after reading this blog. 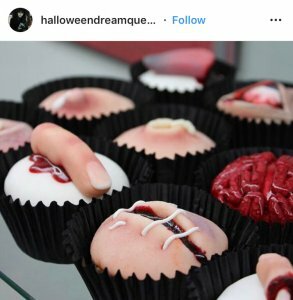 We’ve rounded up a whopping thirteen different Instagrammable Halloween treats for you to try, and we can’t wait to hear which ones you decide to make for yourself! Keep on scrolling for all the goodies. 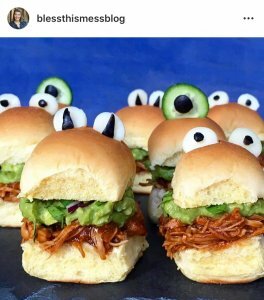 The flipp’n awesome gems at RedTart have put together this Instagrammable Halloween party food inspo, and we couldn’t be happier! This one is pretty easy, and perfect if you’re planning a BBQ or dinner event. 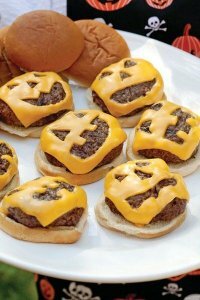 Just carve out evil faces on the cheese (using a clean knife) after placing it on your burger patties, and you’re done! 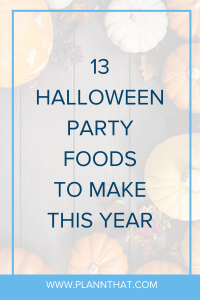 Now, you *might* just be looking for some healthy Halloween party foods to make… we totally get it. This one is super simple! Grab some bananas, pop some chocolate chips or black sesame seeds on them as eyes and voila… you’re sorted. 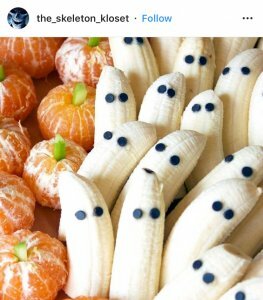 PSST –> Check out more Instagram Halloween Inspiration to get your feed in the spooky spirit here! This one almost made us throw up in our mouths… is that a good thing? I guess so?! Well, to create these ‘bits and pieces’ cupcakes (and to make them super realistic) you’ll need some really wicked kitchen skills. PSST –> Check this post out for more details on Halloween content ideas to post during spook-tober! Isn’t this one just so smart? 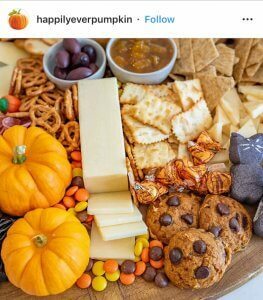 If you love a good cheese platter, you don’t have to put that idea to bed just because it’s Halloween! We’ve seen some super cool themed cheese platters, including one where the cheese has been cut into little coffins to create a zombie graveyard. Funky right?! Now for our healthy fiends out there, you can try this Skull Shake out for yourself! It helps if you have chia seeds to make a sludgy, chia pudding element. And the finishing touch of a skull-shaped glass makes all the difference. This one is really fun to make with the help of your kiddies! 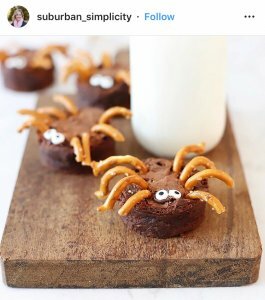 Grab some pretzels and make a tray or two of brownies so that you can cut them into small circles for the spider’s body. Another ‘healthy’ option, or just an idea to jazz up burgers at a barbeque – here are the ‘Monster Burgers’. Another cute one to make with kiddies! Grab some marshmallows, white candy melts and some pretzels and you’ll be well on your way to recreating this Instagrammable Halloween party treat. Um… so yeah. This one is a bit too realistic for me. I don’t think I could eat these without gagging! But, if you’re into this type of thang… go ahead and make those finger buns until your heart is content! A bit of fun we might say! 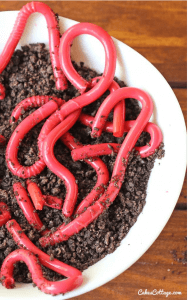 This Instagrammable Halloween party treat is probably best enjoyed by kids. This one is easy, so don’t give up now! Marshmallows, chocolate frosting, some sprinkles… you’re done. 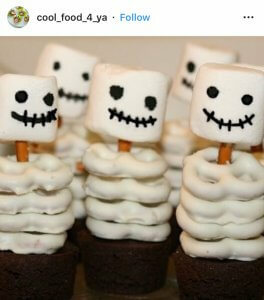 How cool is this Halloween party treat? We think it’s boo-tacular! 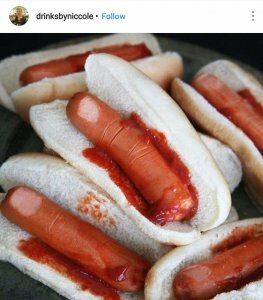 Now we’re getting into the Instagrammable Halloween party treats for adults! 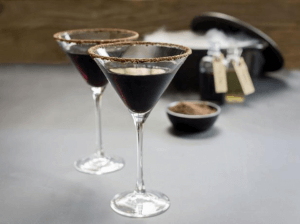 This one is sure to send chills down the spines of your guests… grab the full recipe for this Instagrammable Halloween cocktail here. If you’ve got some martini glasses lying around, they’ll make for the perfect Witch’s Hat cocktail this Halloween. 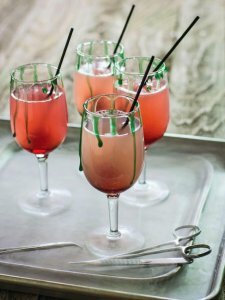 Again, this recipe can be found in the same list as our friend the ‘Morgue-A-Rita’ so jump on over there for the goods!